In the upstream segment, LOTOS operates in Poland, Norway and Lithuania, extracting crude oil and natural gas from onshore and offshore fields. In 2015, LOTOS reported record-high volumes of hydrocarbon production. LOTOS Petrobaltic is the main company responsible for the development of the exploration and production segment within the LOTOS Group. LOTOS Exploration & Production Norge is the subsidiary responsible for the development of operations on the Norwegian Continental Shelf. Currently, LOTOS Norge holds licences for oil exploration and production in the North Sea and the Norwegian Sea. LOTOS Petrobaltic owns AB Geonafta (currently LOTOS Geonafta), which produces crude oil from onshore fields in Lithuania. Grupa LOTOS’ refinery in Gdańsk, with a rated annual capacity of 10.5 million tonnes of crude, is one of the newest and most advanced refineries in Europe in terms of applied technologies and environmental protection. To a large extent, the refinery owes its technological advancement to the LOTOS Group’s 10+ Programme completed in 2011, the largest industrial investment project of the last decade in Poland in terms of capital expenditure (PLN 5.6bn). A natural continuation of the wider effort to technologically modernise the refinery, supplementing the crude oil processing chain created under the 10+ Programme, is the EFRA (Effective Refining) Project − innovation of the 21st century. EFRA is carried out by LOTOS to ensure more advanced and deeper conversion of crude oil at the Delayed Coking Unit. The refinery’s location is a source of major competitive advantage in the region in terms of logistics (access to feedstock and product sales channels). 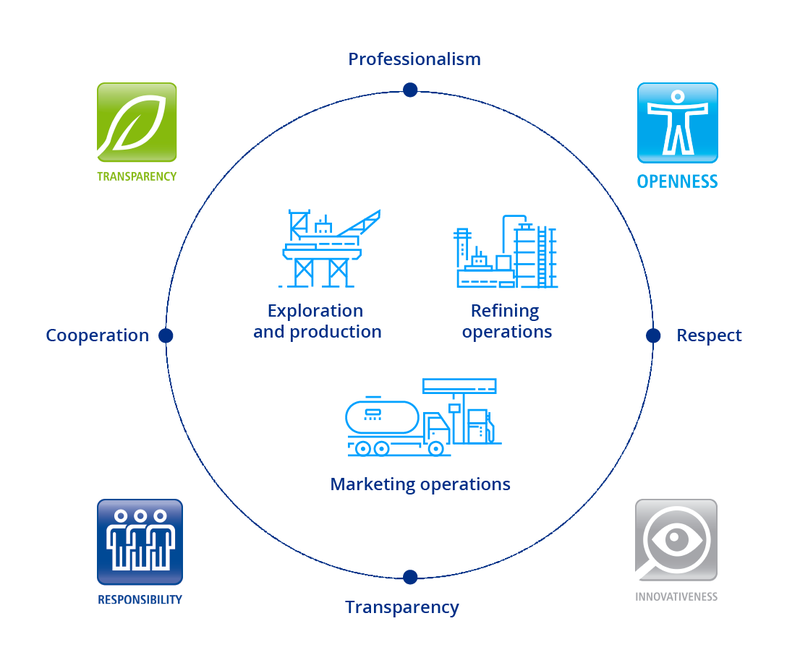 The LOTOS Group’s refinery benefits from a unique combination of supply channels, guaranteeing it simultaneous access to feedstock supplies by road and via PERN’s pipeline network, as well as by sea, from numerous countries and the Group’s own fields. All this helps the LOTOS Group to diversify its supply sources and respond flexibly to changes in petroleum product and crude oil prices. The LOTOS Group’s marketing activities in 2015 were carried out by Grupa LOTOS and its subsidiaries: LOTOS Paliwa, LOTOS Oil, LOTOS Asfalt, and LOTOS-Air BP Polska. Grupa LOTOS conducted its business domestically (sales to foreign companies) and through export sales, by sea and by land. Its subsidiaries’ production and sales were targeted at the fuel, lube and bitumen industries. The LOTOS Group sold fuels on the domestic retail market exclusively through LOTOS Paliwa. On the wholesale market, the LOTOS Group operated both through Grupa LOTOS S.A. (supplying fuel to international corporations and key customers) and through LOTOS Paliwa (transactions with wholesale customers and independent operators). The rise in output and sales was an effect of refining margins remaining very strong for the most part of 2015. In 2015, we successfully completed implementation of the LOTOS Group’s Business Strategy for 2011−2015. The key objectives we had set in that document were met. We increased our production potential and improved operational efficiency. We also consolidated our position in the retail fuels market. All of our development-oriented activities were pursued with due regard to the ideas of sustainable development and corporate social responsibility, the key propositions of which we defined in our CSR Strategy for 2012−2015. Development and innovative projects are a core element of investment efforts undertaken by the LOTOS Group. Encoded in our corporate DNA, they allow us to maximize our profits and drive value for our stakeholders. With our innovative and flexible approach, we can tackle major challenges in the market, bolster our competitiveness and ensure superior quality of our products and services across all our business segments. By consistently implementing its strategy aimed at maximizing the integrated margin, the LOTOS Group succeeded in increasing its production potential and operating efficiency, which contributed to its sound operating performance in 2015. In 2015, we commenced work on a value creation model for the LOTOS Group and on the related business model. The value creation model includes potential benefits to the LOTOS Group and its stakeholders, and the respective value drivers. Benefits generated under more than one capital are included in the model once and attributed to the capital to which they are most specific. From the broad range of financial and non-financial results, we have selected those that contribute the most to value creation for the LOTOS Group and its environment. Selected indicators showing progress towards our long-term goals under each capital. Financial capital represents tangible resources in the form of a pool of funds available to the organization in connection with its operations. It refers to the available capital as well as the organization's debt and equity finance ability. How do we create value in the LOTOS Group? Our primary objective is to maximize the LOTOS Group's value for its owners. To this end, we optimize our capital structure and manage the Company in a manner ensuring financial liquidity and an appropriate level of operating stocks. Since we realize that maximization of the company value for its owners requires investment, we take care to maintain sufficient levels of capex and maintenance and replacement expenditure. We ensure the necessary funding for investment projects, while bearing in mind safety and protection of the organization's assets. Furthermore, we take steps to maximize the value of our sales, in particular of high-margin products. Manufactured capital represents tangible resources and, depending on the industry, may comprise: buildings, equipment, machinery, technology, and infrastructure (e.g. roads, bridges, waste and water treatment plants) that are used in the production of goods and provision of services. It is our objective to optimize the product mix and expand the LOTOS service station chain. We build our manufactured capital though obtaining new hydrocarbon production licences and effective use of those already held. The environment we operate in necessitates active search for new ways to diversify supplies of crude oil and other raw materials to secure operational flexibility. We seek to optimize manufacturing processes through implementation of innovative technological solutions, efficient management and use of our production assets, and reduction of failure rates for our plant and equipment. We devote much attention to the level of costs incurred to maintain our units and equipment in a proper technical condition and to ensure proper functioning of the plant engineering and maintenance system. With this in mind, we monitor the key infrastructure on an ongoing basis, while remaining committed to maintaining top quality of our products. We also seek to improve our potential in railway transport services. Intellectual capital represents intangible resources based on knowledge. It comprises factors such as investments in R&D, innovation, employees' creative and intellectual capabilities. Growth of the LOTOS Group is driven by innovation-oriented culture. We seek and employ new, innovative solutions and to secure financing for effective research that brings the expected benefits. We actively employ our organization's and staff's expertise and experience in all our projects. We profitably use of our patents and seek to obtain new ones, being aware of the need for constant development and improvement of the organization and its processes. Human capital represents intangible resources made up of individual employees' skills and expertise, experience and motivation, as well as capacity to develop. Since human capital is created by people, we take care of our employees' development and carry out programmes to ensure continuous improvement of their skills. We recruit qualified staff to bolster our organization, and strive to make productive use of the already available potential and experience. We aim to create a friendly workplace for our staff and develop corporate culture underpinned and governed by values. Social capital represents intangible resources built by reciprocal benefits from trust and high-quality relations between the company and its social environment. We are aware of our impact on the society and take care to manage it effectively. We make effort to build partnership-based relations with our suppliers, trading partners and customers, and ensure high-quality service, thus reducing the number of complaints and raising our customer and partner satisfaction levels. Local suppliers are part of our value chain; we seek to make use of their potential and support their further development. We are members of domestic and international industry organizations to empower ourselves with the experience of other companies, and share our capabilities in return. We do not neglect our social environment, consistently implementing CSR initiatives, and we take care to incorporate the social dimension in our image-building campaigns. Natural capital represents tangible resources used by the organization in the production of goods and provision of services, including renewable and non-renewable resources. We pursue our financial and production goals with care for the environment and in compliance with the applicable legal requirements and regulations. We implement solutions to optimize the use of natural resources, and carry out pro-environmental projects improving safety of our operations in this respect. For the good of the natural environment, we take steps to reduce the number of incidents, failures and accidents which may adversely affect it. We bear in mind the environmental dimension of our activities also in terms of logistics and transport optimization. We are responsible for our impact on the environment and for the way we build our relations with key community and business groups in that environment, including the LOTOS Group’s employees and customers. © GRUPA LOTOS S.A. ul. Elbląska 135, 80-718 Gdańsk, Poland, The joint-stock company entered into the National Court Register, maintained by the District Court for Gdańsk-Północ, VII Commercial Division, under entry No. KRS 0000106150. Tax Identification Number (NIP): 583-000-09-60. Industry Identification Number (REGON): 190541636. Share capital PLN 184 873 362 paid up in full.